Echo Gear is a "hybrid codex," a mash up of imagery, text, sequential art, editorial and advertorial nodes. 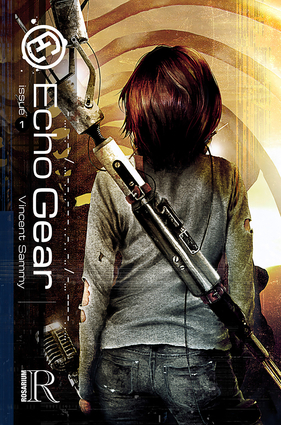 A story told in codes, puzzles, wordplay, and cross-referenced archaic media.It's a time of love and regret in Echo Gear. "When nothing around us mattered.And all was pure and tranquil." Vincent Sammy is a freelance illustrator working in the fields of horror, science fiction, fantasy, and the macabre.He has provided artwork for magazines such as Something Wicked, Black Static, and Interzone, as well as for book publishers such as Jurrasic London and Doghorn. His artwork has been featured in the movie, Chronicle, and he has been nominated for an “Artist of the Year” award by the “This Is Horror” Awards for 2012 and 2013.Watercolor is his preferred medium, but he also makes use of digital tools in post-production.He has published the first issue of his hybrid-codex (a combination of illustration, sequential art, magazine design and layout, and prose/poetry) called Echo-Gear and plans to release the second issue this year.He resides in Cape Town, South Africa, where he is preparing for the zombie apocalypse. Vincent Sammy is a freelance illustrator working in the fields of horror, science fiction, fantasy, and the macabre.He has provided artwork for magazines such as Something Wicked, Black Static, and Interzone, as well as for book publishers such as Jurrasic London and Doghorn. His artwork has been featured in the movie, Chronicle, and he has been nominated for an “Artist of the Year” award by the “This Is Horror” Awards for 2012 and 2013.Watercolor is his preferred medium, but he also makes use of digital tools in post-production.He has published the first issue of his hybrid-codex (a combination of illustration, sequential art, magazine design and layout, and prose/poetry) called Echo-Gear and plans to release the second issue this year.He resides in Cape Town, South Africa, where he is preparing for the zombie apocalypse. Vincent Sammy is a freelance illustrator working in the fields of horror, science fiction, fantasy, and the macabre.He has provided artwork for magazines such as Something Wicked, Black Static, and Interzone, as well as for book publishers such as Jurrasic London and Doghorn. His artwork has been featured in the movie, Chronicle, and he has been nominated for an “Artist of the Year” award by the “This Is Horror” Awards for 2012 and 2013.Watercolor is his preferred medium, but he also makes use of digital tools in post-production.He has published the first issue of his hybrid-codex (a combination of illustration, sequential art, magazine design and layout, and prose/poetry) called Echo-Gear and plans to release the second issue this year.He resides in Cape Town, South Africa, where he is preparing for the zombie apocalypse. Vincent Sammy is a freelance illustrator working in the fields of horror, science fiction, fantasy, and the macabre.He has provided artwork for magazines such as Something Wicked, Black Static, and Interzone, as well as for book publishers such as Jurrasic London and Doghorn. His artwork has been featured in the movie, Chronicle, and he has been nominated for an “Artist of the Year” award by the “This Is Horror” Awards for 2012 and 2013.Watercolor is his preferred medium, but he also makes use of digital tools in post-production.He has published the first issue of his hybrid-codex (a combination of illustration, sequential art, magazine design and layout, and prose/poetry) called Echo-Gear and plans to release the second issue this year.He resides in Cape Town, South Africa, where he is preparing for the zombie apocalypse.